Oh My Goodness! Levi’im 2015 has been going ham! After a full ten months of anticipation, the chanichim (campers) arrived back at camp ready to begin a new summer. The morning was filled with ice breakers, frisbee, and catching up on the past year. Following the usual opening day lunch of pizza, the chanichim returned to their tzrifim (bunks) to finish unpacking, to see their friends who had arrived from the airport and bus, and to get ready for the afternoon. The chanichim spent the next few hours playing sports, taking their swim tests, and choosing their kitot (summer classes), a privilege that comes along with being a Levi’im chanich/a. As the sun descended into a brilliant kaleidoscope of hope and color, we ate real schnitzel (and fake schnitzel for the tzimchonim [vegetarians]) at dinner. 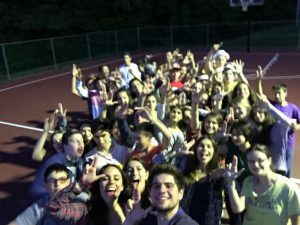 The chanichim spent their peulat erev (night activity) playing games planned by the madrichim such as “Can I have your space,” knee tag, charades, and acting out a machine. The peulat erev ended with a selfie of the entire aydah (unit) and the traditional rad hayom (“the day has ended,” the song we sing at night). The chanichim tactically retreated back to their tzrifim, got ready for bed, and made communal bunk rules to be followed throughout the summer. Each chanich/a fell asleep smiling as they settled into their new summer home, feeling safe, energized, and pretty darn tired. This morning began with raucous davening and raucous french toast. 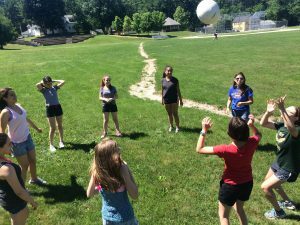 Afterwards, the young-yet-older chanichim cleaned their tzrif and will be starting their kitot and swim classes, picking their chugim (electives), and all around having a wonderful time as their summer at Machane Yavneh (Camp Yavneh) really begins!